Mastering intuitive mechanism of everlasting bliss and success! Description of "The Science of Blissful Living"
Are you frustrated with life without a purpose? Want to make your stay worthwhile in this universe, but don’t know how? Want to live life with peerless state of joy and bliss? Want to avoid being a victim of self-destructive “instinct and habits” and become a staunch follower of your “inner voice”? Then this book is an ultimate guide for you. Once the pearl of knowledge and wisdom contained in this book is understood, the rest of your life would then be an exhilarating journey to maximize the state of bliss. 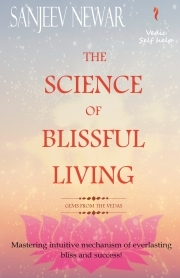 “The Science of Blissful Living,” the first book under “Vedic Self-Help” series, satisfactory answers the most fundamental questions regarding the essence of life and living and our role in this universe. The book has three sections. With the datum of ‘truth and bliss are two sides of the coin’ in its foundation, the first section provides the complete understanding of how toolkit for acquiring and enhancing ‘true’ knowledge works. The second section gives tips on how we can practically apply that ‘true’ knowledge to make our stay worthwhile in this universe. It also warns us of the consequences we would face if we kill our inner voice for temporary worldly pleasures. The third section inspires us to tap the unlimited power that lies within all of us to strengthen our will power so that we can follow the inner voice for blissful life. The learning from this book would be a paradigm shift in your thought patterns, and an absolute guarantee that regardless of the situations, pressures, and compulsions of life, you will still be able to enjoy and live life to fullest. Master the intuitive mechanism of everlasting and bliss and success. NOW! evident in his writings as well as products. His risk management products have been named in top 20 of the world for 2014, 2015 and 2016. He is the only Indian to have ever made to this list. He has been behind several inclusive and encompassing innovations. He is a mentor to several eminent young scientists of the country. Sanjeev Newar is an alumnus of IIT Guwahati and IIM Calcutta. Reviews of "The Science of Blissful Living"